The Lorch family was a highly respected Jewish circus family that owned a circus in Germany intermittently from the nineteenth century until 1930. Founded by Hirsch Lorch (1817-1901) in the second half of the nineteenth century, Circus Lorch was continued by his sons, Adolf (1845-1918), who was born in Manheim on May 4, 1845, and Louis (1847-1924), born in Lörrach, in Baden-Württemberg, on July 14, 1847. Before the turn of the twentieth century, the brothers worked in partnership, and their Circus Gebrüder Lorch traveled principally in southern Germany, Switzerland, and Austria. The family acts presented in the show included horsemanship and a remarkable Risley actAct performed by Icarists, in which one acrobat, lying on his back, juggles another acrobat with his feet. (Named after Richard Risley Carlisle, who developed this type of act.) 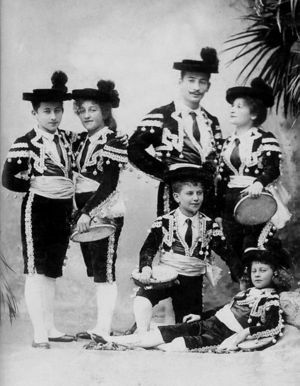 performed by Louis’s children, which would acquire a towering reputation on the international circus and variety scene during the first half of the twentieth century. The circus maintained winter quarters in Eschollbrücken (today part of Pfungstadt, in the district of Darmstadt-Dieburg) in southern Hessen, where Hirsch Lorch and his family had settled in 1870. At the beginning of the twentieth century, while Adolf continued to manage the circus, Louis and his many children went on their own with their Risley actAct performed by Icarists, in which one acrobat, lying on his back, juggles another acrobat with his feet. (Named after Richard Risley Carlisle, who developed this type of act.). (Under the sole management of Adolf, Circus Lorch lasted until the beginning of WWI.) With up to eleven performers (family members and partners or apprentices), and at times, horses, Louis’s Lorch Family act was one of the world’s biggest—and indeed one of the best—Risley acts. A true star attraction(Russian) A circus act that can occupy up to the entire second half of a circus performance. and very much sought after, it toured for nearly three decades with considerable success in Europe, the United States and South America.